Instagram has unveiled its foray into video uploads with an app for iOS and Android that captures 15 seconds of video and gives amateur auteurs some fancy tools to play with to make it special. "At our core, visual imagery is everything. It's in our DNA and it's what drives us," said Instagram CEO Kevin Systrom at a press conference on the Facebook campus. "One of the most amazing things about us humans is our ability to create tools to remember. We are forever on a quest to take a moment and record it forever in time. However long or short life is we know we many never get that moment back." Video was originally in Instagram's business plan, he explained, but said that the team hadn't included it since the upload times were too slow and editing video was too hard. 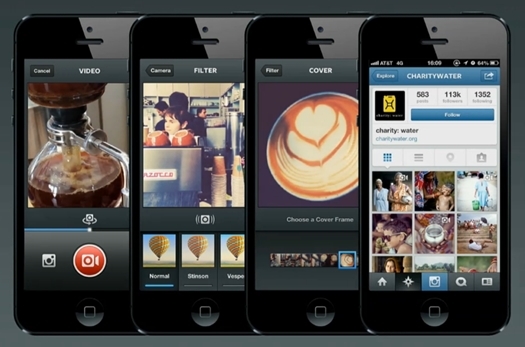 Now, with Facebook's backing, Instagram is ready to make the shift. The team settled on 15 second video bursts, which is "not too short to stifle creativity and not too long to upload," Systrom said. It coincidentally more than doubles the allowed video time of recent video competitor Vine. The app has 13 custom filters designed expressly for video and the company has hired image scientists to build a function called Cinema, which stabilizes shots taken with shaky hands. The shots can then be put up on the web or spammed out via Facebook, with the initial image on the link being chosen by the shooter from frames taken from their video. There's a minimum clip length of three seconds and all video must be taken within the app – so no uploading of past triumphs will be allowed. The backend should ensure that buffering isn’t an issue, Systrom said. He demonstrated the app using a video of – surprise surprise – someone pouring a cup of fancy coffee so beloved by his hipster user base. The filters work as specified and the Cinema image stabilization system works rather well – certainly on par with Nokia's system.